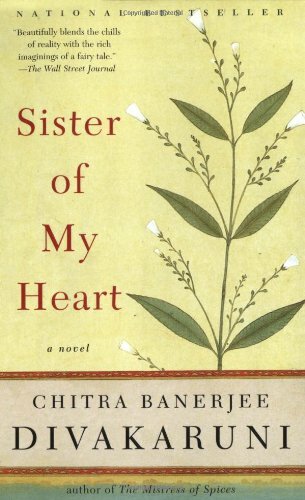 This is a poignant story of two girls who grew up in the same household and who had a very deep bond with one another. It is also a comment on the lives of girls and women in India and of how much of their lives is bound up in duty and tradition. Of course, secrets play a large part as well. I would love to see a sequal to this book. This book is being reserved for my "Family Members Virtual Bookbox". Picked up tonight from loveamystery - from her "Family Members Virtual Bookbox". What a great read! Never put it down - enjoyed this immensely. Great atmosphere and carefully drawn characters. I second loveamystery's wish for a sequel. Reserving for the Passport to the World virtual bookbox. Chosen from the Passport to the World Bookbox by itpdx. Now in the mail. Beautiful, sweet, eye-opening. The story of "twin cousins" growing up in a declining upper-class female household in India. Divakurni sets the scene lyrically and subtly. She allows the girls to develop and mature together but according to their distinct personalities. The caste/class divisions and attitudes of recent India were a revelation to me. Left at the OBCZ to the west of the fireplace.